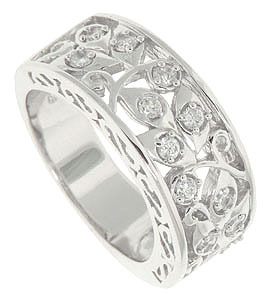 Curling vines of diamond encrusted leaves spring from the edges of this spectacular 14K white gold wedding band. This modern wedding ring is set with .36 carat total weight of diamonds which cover three quarters of the rings' circumference. The ring measures 8.77 mm in width. Size 6 1/2. We can resize. The wedding band can be ordered in any size and is also available in 18K, yellow gold and platinum.